So saying, he slowly and carefully wrote his name at the bottom of the proclamation. The signature proved to be unusually clear, bold, and firm, even for him, and a laugh followed at his apprehension. My father, after appending his own name, and causing the great seal to be affixed, had the important document placed among the archives. Copies were at once given to the press. 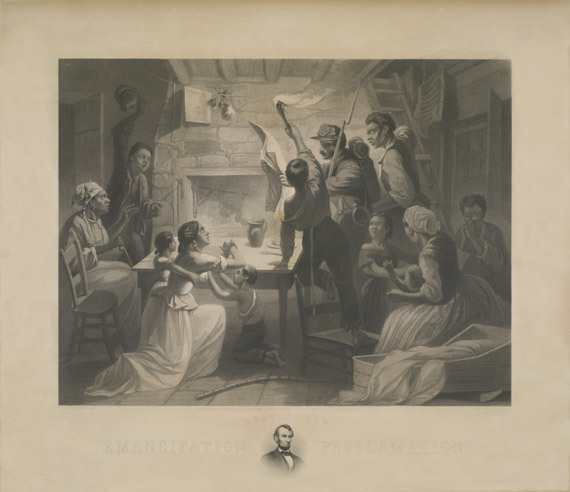 Many abolitionist churches in the North and communities of contraband slaves in Union camps in the South held watch night services on Dec. 31 to await the final proclamation. This year, on the 150th anniversary of the proclamation, some organizations are continuing this tradition, and the document is on exhibit for a limited time at the National Archives. Arkansas, Texas, Louisiana, (except the Parishes of St. Bernard, Plaquemines, Jefferson, St. Johns, St. Charles, St. James[,] Ascension, Assumption, Terrebonne, Lafourche, St. Mary, St. Martin, and Orleans, including the City of New-Orleans) Mississippi, Alabama, Florida, Georgia, South-Carolina, North-Carolina, and Virginia, (except the fortyeight counties designated as West Virginia, and also the counties of Berkley, Accomac, Northampton, Elizabeth-City, York, Princess Ann, and Norfolk, including the cities of Norfolk & Portsmouth [)]; and which excepted parts are, for the present, left precisely as if this proclamation were not issued. What’s a nice Google user like you doing at a blog like this? The recent bumper crop of Lincoln movies has obviously helped bump up my traffic, especially in the past few weeks. In fact, of the top twelve search terms of the past month, seven involve some combination of “Lincoln” and “Ethan Allen,” so that scene in Spielberg’s movie that I got such a kick out of must have made an impression on a lot of other people, too. There’s a hubbub brewing over new social studies standards for Minnesota’s schools. As is generally the case in these situations, there’s a fair amount of knee-jerk alarmism mixed in with the legitimate concerns. Well, certainly the Revolution and the Civil War did affect Americans generally, but it didn’t affect all of them in the same way. If you were a white male living in Pennsylvania, the Revolution probably resulted in a greater exercise of political power. If you were a white woman living in Massachusetts, you took on new roles as a republican mother and citizen. If you were an enslaved black male who managed to hitch a ride with the British as they evacuated the seaboard cities, you got freedom. And if you were an Indian of any gender living in the Ohio Valley, the Revolution wasn’t exactly a bonanza. There’s nothing wrong with teaching kids about the varied effects of important events. Indeed, history teachers need to introduce the complexity involved in significant events like the Revolution. Hinderaker also charges the standards with attributing “institutionalized racism” to big business. But that isn’t exactly what the relevant passage says: “As the United States shifted from its agrarian roots into an industrial and global power, the rise of big business, urbanization and immigration led to institutionalized racism, ethnic and class conflict, and new efforts at reform. ” The standards are clearly dealing with a number of transformations in the U.S. during the late nineteenth and early twentieth centuries, of which the rise of big business was only one. The rise of big business, the growth of cities, and immigration resulted in a number of changes in American life, including racism, class conflict, and reform efforts. And, of course, shifts in immigration patterns and urban growth in the late nineteenth and early twentieth centuries did result in institutionalized racism, as evidenced by the emergence of measures like the Chinese Exclusion Act and the restrictions on Asian immigration in the Immigration Act of 1917. Perhaps, then, the problem isn’t with the standards, but with the reading comprehension of the people criticizing them. Or perhaps the problem is something else. Hinderaker writes that when he saw Joseph Brandt’s name on the standards’ list of “historically significant people” from the American Revolution, he had no idea who he was and had to look him up. 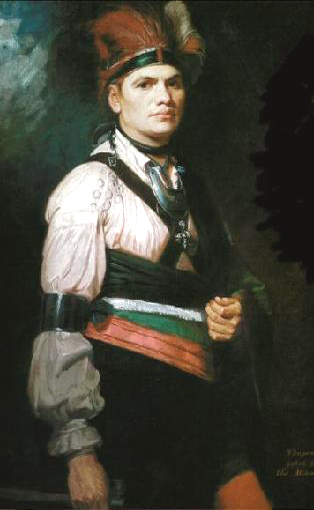 He notes only that Brandt was “a Mohawk Indian,” which is sort of like saying that Stonewall Jackson was “a guy from Virginia.” Since Hinderaker had to look up the name of one of the most important figures of the Revolutionary frontier, might I suggest that he isn’t the person to be assessing standards for teaching history in Minnesota’s schools? 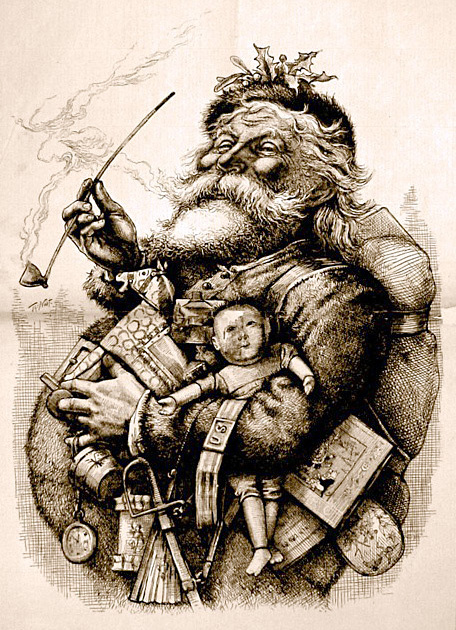 Maybe a vintage Thomas Nast cartoon will help you get in the holiday spirit. The Georgia State Archives won’t be closing after all. This is shaping up to be a pretty good Christmas for all us history buffs. Oh, and the world didn’t end yesterday. So there’s that, too. This ought to bring some holiday cheer to anybody who cares about battlefield preservation. 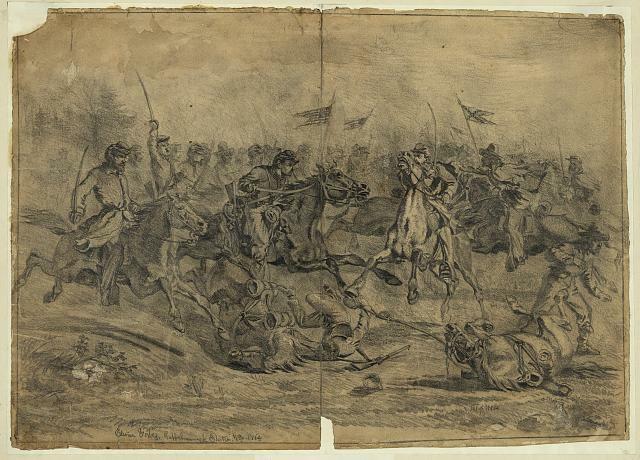 The Civil War Trust has an opportunity to acquire one of the most historic parcels of ground in the country at Brandy Station. I second Eric’s call to action: This is the time for all of us history aficionados to help make this happen. If you’re like me and aren’t in a financial position to write a big fat check with lots of zeroes in it, here’s a simple way to pitch in. Lots of our friends and co-workers are scrambling around to find last-minute Christmas presents for us. What if we e-mailed these folks and asked them to take the money they’d normally spend on a gift for us and send the same amount to the Civil War Trust instead? Every little bit helps. Alternatively, if you need to find a Christmas present for the history buff in your life, consider making a donation to the CWT in their name. They’ll appreciate that more than a sweater or fruitcake, and it’ll last longer. Check out the latest post in Gordon Belt’s series on the memory of John Sevier, in which he examines the work of James R. Gilmore, the nineteenth-century writer who did for Sevier what Parson Weems did for George Washington.